How to File a Personal Injury Case in Iowa | Hupy and Abraham, S.C.
How do I file a personal injury lawsuit in Iowa? You’ve done your research. You understand how a personal injury case works in Iowa, you believe that you have a case, and you expect that the court will award you damages for your injuries. Now, however, you have to take action and file your case correctly so that you can begin the process of getting the compensation that you deserve. The names of all parties involved. This includes you and anyone that you are naming as a defendant in your lawsuit. Your theory of recovery. You must provide your legal grounds for filing a lawsuit. Many personal injury plaintiffs allege that the defendant was negligent, for example. The relief that you are seeking. This is where you tell the court about the injury and damages that you suffered because of the defendant and about the specific compensation that you are seeking. In addition to filing this petition (also known as a complaint) in an Iowa district court, you will need to make sure that the petition is served (or properly delivered) to each defendant in the case. The rules explained above may seem easy to follow, but they can be complicated. The information that you provide in your petition is going to set the stage for your lawsuit and eventual recovery. You need to get it right and we can help. Our experienced personal injury lawyers will make sure that your rights to all potential compensation will be protected. 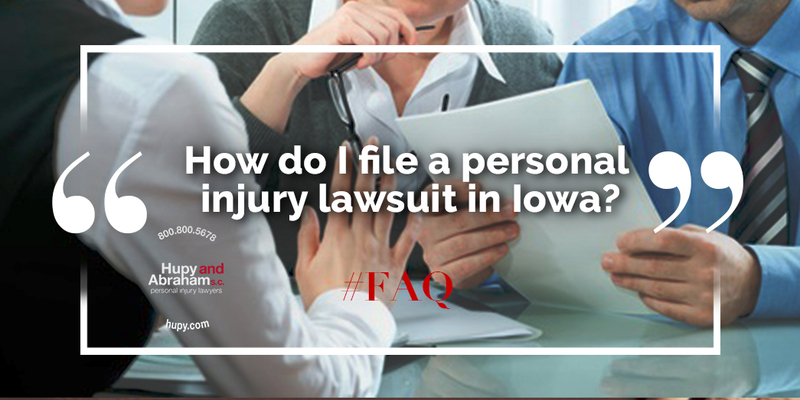 For more information about filing a personal injury case in Iowa or about your possible recovery, we encourage you to contact us online or call us directly at 800.800.5678. We would be happy to set up a free consultation and to help you take the legal steps that you need to take before the statute of limitations expires and you no longer have time to file your claim.